Goat yoga, alpaca yoga and dog yoga came before it and now, “lemoga” – or yoga with lemurs – is the newest trend making rounds in health and wellness. 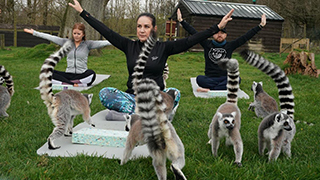 The Armathwaite Hall Hotel and Spa in England is now offering the “Lemoga Spa Break,” where participants practice yoga outdoors with lemurs. With a starting rate of $860 per night for two people, the Lemoga Spa Break includes a three-course dinner in Courtyard Bar and Brasserie Restaurant, a 55-minute spa treatment, full use of the spa facilities and, of course, a “Lemoga” session with yoga instructor. The program is in partnership with the Lake District Wildlife Park, where the lemurs already live naturally. The hotel’s website says that each session is managed by an experienced keeper and subject to the keeper’s approval and availability. The lemurs, known to be quite friendly and social, also have the freedom to stay or leave as they please. According to Richard Robinson, manager of the Lake District Wildlife Park, these ring-tailed primates seem to have a natural affinity for yoga poses. Armathwaite Hall Hotel and Spa also claims that yoga with lemurs reduces stress, decreases blood pressure and overall is just a good way to feel one with nature. This isn’t the first time that animals make guest appearances in the hotel’s programming – other options include alpaca walks around the hotel’s 400-acre grounds, meet-and-greets with meerkats and special sessions with zookeepers.